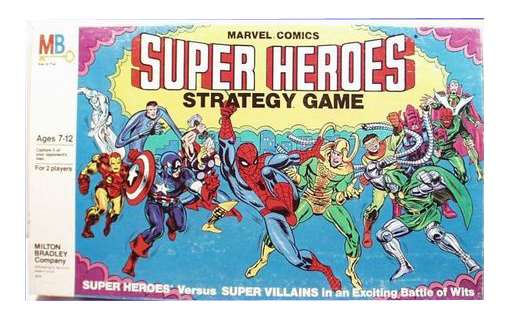 Milton Bradley released the Marvel Comics Super Heroes Strategy Game (#4019) in 1980. 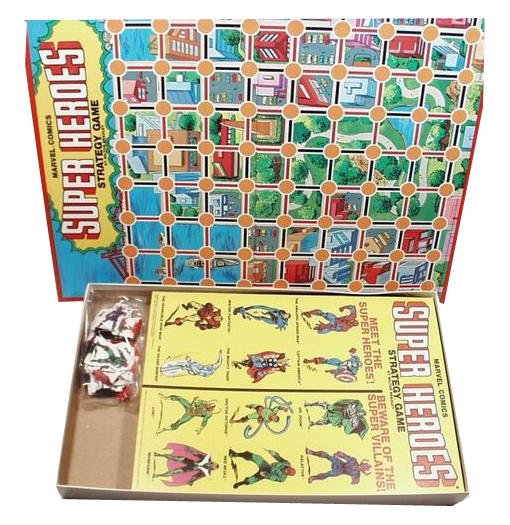 According to the box, The game pitted Super Heroes against Super Villains in an exciting battle of wits. "Plot, play and place your pawns strategically! That's the key to winning this exciting chess-like game dueling Super Heroes and Super Villains. You and your opponent maneuver the marvelous Marvel Comics characters into strategic positions on the game board city so you can trap and capture each other's pawns. The object is to capture you opponent's men. To be a winner, you must capture 5 of your opponent's men." Fantastic art and great nostalgic value for anyone who enjoyed this board game in the early 1980s!